The last 25 years of the 20th century saw the development of a new sport, disc golf. With the rising importance of fitness, and the realization that fitness is directly associated with health and longevity, disc golf has moved to the forefront of fitness activities. 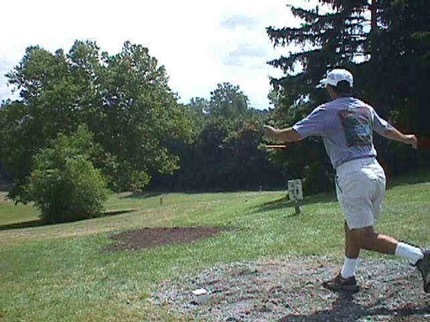 The sport has grown faster than any other sport, and in the last twenty years over 1600 new disc golf courses have been built in the U.S.
Disc golf has many advantages over other sports and fitness activities. It combines the fitness advantages of aerobic exercise, with the pleasure and excitement of playing a fun game. 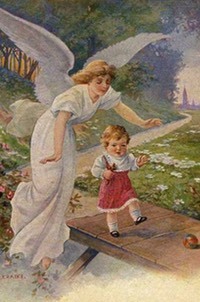 In this way, exercise is disguised as "play", so that both children and adults will look forward to it every day. The complex nature of disc golf provides ever-changing challenges for adults, keeping up their interest, and it often becomes addictive (a good quality for a fitness sport). Disc golf has many of the advantages of regular golf: fresh air, relaxing setting, mentally stimulating challenges, interaction with friends, and an addictive form of exercise. 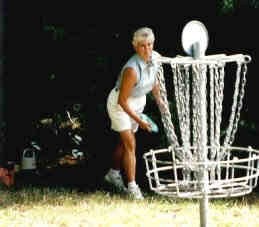 Disc golf is an "age-friendly" sport, since you can continue playing and increasing your skills well past your 60's. Two additional advantages of disc golf are (1) It is free, and (2) It provides twice the fitness benefit of most recreational sports. In and near Bowling Green, we have many public disc golf courses, located at Kereiakes Park, Griffin Park, Hobson Grove, Lovers Lane Soccer Complex, Preston Miller, Phil Moore Park and Ephram White Park . All are free to play whenever you want. Just bring your frisbee. There is also a nine hole course at Natcher Elementary School, which is available to play whenever school is not in session, daylight hours only. Disc golf is played basically the same as regular golf, counting your throws as "strokes" on each hole, and trying to get the frisbee into the basket in the fewest possible throws. There are 18 holes on each course. I would recommend starting at Lovers Lane. For a greater challenge and a chance to improve your accuracy skills, you will enjoy Hobson Grove. As you improve, invest in a "golf disc" which is a flatter and smaller version of the frisbee. These cost only about $7-15, and are available at Nats and other sporting stores. A golf disc will increase your distance quite a bit, but you will have to alter your technique! There are several pro players in town (including me and Sylvia) who can help you with technique, and I would strongly advise getting some pointers before you develop bad habits that might be hard to break. * Throw a low line drive, only 10 feet off the ground, for both greater distance and accuracy. * Grip using all your fingers, don’t leave your index finger on the outside of the rim. * "Putting" at the basket from inside 33 feet is a totally different technique to learn. * Release the disc at a flat angle, not with the far edge tilted down. * You can learn to make the throw curve either to the left or to the right. Disc golf is an exellent family activity, since players of different skill levels can easily play together. Sylvia and I compete with each other by using a handicap (I give her 12 strokes). Most players are basically playing against the course, trying to improve their best score. Find out more about disc golf at PDGA.com. Over 40% of disc golfers households have an annual income over $50,000. Over 20% of disc golfers work in a middle/upper/executive management position. Over 70% of disc golfer households have a computer and use the internet. About 1/3 of disc golfers travel for business. 40% of disc golfers have at least one child. Over 40% of disc golfers invest in the stock market. Over 90% of disc golfers play at least once a week. At least 60% of disc golfers shop by mail order. Nearly 3/4 of disc golfers subscribe to cable TV.